Akhtar Mansour is seen here in a photo taken in Frankfurt, Germany, during 1998. Mullah Akhtar Mohammad Mansour (/ˈɑːktɑːr ˈmɑːnsʊər, ˈæktɑːr ˈmænsʊər/; Pashto: اختر محمد منصور‎; c. 1968 – 21 May 2016) was the leader of the Taliban, an Islamic fundamentalist political movement in Afghanistan, from 29 July 2015 to 21 May 2016. On 21 May 2016, the United States conducted a drone strike on a vehicle which had crossed into Pakistan from Iran. The vehicle was carrying Mullah Akhtar Mansour and he was killed. Mansoor is thought to have been born either in a village named Kariz or another village named Band-i-Taimoor (source: I.E.A. ), both of which are situated within the Maiwand District of Kandahar Province in southern Afghanistan, sometime during the 1960s. The biography released by the Talibans' Islamic Emirate of Afghanistan website shows 1347 for his date of birth, which is according to the solar Hijri calendar, which corresponds to 1968. This year of birth is corroborated by S. Mehsud, of the C.T.C. West Point. According to Ahmed Rashid, Mansoor belonged to the Alizai tribe, but other sources claim that he was of the Ishaqzai tribe,[note 1] in any case, both the Alizai and the Ishaqzai are of the Durrani line of the Pashtun people. Mullah Mansoor was educated at a village mosque and joined primary school at about the age of seven (source: I.E.A.). Sometime during the year 1985, he joined the jihadi war against the Soviet invasion of Afghanistan. This involvement included his participation within the Mohammad Nabi Mohammadi group. During the same time Mohammad Omar was a commander of an organization within Mohammad Nabi Mohammadi. Mansoor participated in the war ( jihad ) against members of the Soviet military, within Maiwand, Sang-e-Hessar, Zangawat and other parts of the city, and the Pashmul area of the Panjwai district, under the command of Mullah Mohammad Hassan Akhond, apparently commanded by him at least while fighting at the last location. During 1987 he was apparently injured (sustaining 13 separate wounds according to the I.E.A. source), while stationed at Sanzary area of Panjwai district in Kandahar. Known as one of the prominent warriors, Mansoor joined the Maulvi Obaidullah Ishaqzai group in 1987 but later Ishaqzai surrendered to Nur ul-Haq Ulumi, now the interior minister. Soon afterwards, he migrated to Quetta. After the war, Mansoor resumed his religious education in different seminaries and later shifted to Peshawar where he joined Jamia Mohammadia at the Jalozai Refugee camp. He was a student at Darul Uloom Haqqania madrassa, which is where Mohammed Omar also studied. He was apparently a popular student, during his time at the madrassa from 1994 to 1995, located within the Jalozai refugee camp for Afghans near Peshawar, Pakistan, according to Afghan journalist Sami Yousafzai, who met him during that time. After the capture of Kandahar airport he was appointed as director general, or otherwise termed, security officer in charge, of the Kandahar airport, a role which encompassed both the air force and air-defence systems of Kandahar. After the taking of Kabul during the 1996 he was made director of Ariana airlines, and additionally Minister of the Emirate for aviation and tourism, by Mohammed Omar, within the Talebani Islamic Emirate of Afghanistan, together with his overseeing the Emirates' air force and air-defence systems, from his additional appointment as head of these within the ministry of defence. Notably, while minister, Mullah Mansoor organized a 24-hour flights services within Afghanistan, thereby organizing the provision of facilities for Muslims to go to Mecca as Hajj via air-flight. During 1996 the Mullah appointed the individual Farid Ahmed to station manager of Ariana airlines. During 1997, when the Taliban tried unsuccessfully to capture the northern city of Mazar-e-Sharif, Mansoor was captured by an Uzbek warlord. For two months he remained there as a prisoner of war before Mohammed Omar traded him out. After the conclusion of the hijacking of Indian Airlines Flight 814, Akther Masour is reported, by Anand Arni, a former officer with the Indian organisation Research & Analysis Wing, as being seen embracing Maulana Masood Azhar, the then leader of Jaish-e-Mohammed. In 2001, he surrendered to the Afghan President Hamid Karzai to ask for amnesty. He was forgiven after which he returned to his home district. American forces however refusing to believe he and other senior Taliban commanders had given up fighting, conducted a series of night raids to capture him after which he fled to Pakistan, where he helped to shape the Taliban as an insurgent organisation. Mullah Mansour was appointed as shadow governor of Kandahar, from sometime after 2001, until May 2007. In a previously secret state communication of the U.S. government in 2006, Akhtar Mansoor was listed as the 23rd member of the Taliban (with the late Mohammed Omar as the first member). According to leaked material, Mansour attended a meeting dated 24 August 2007 with other senior Taliban officials, so that he and those others present might discuss and organize a potential suicide bombing and bombing campaign upon the areas of Kandahar and the Helmand Province, and also particularly focused on killing Ahmad Wali Karzai and Hamid Karzai. The council of the Taliban appointed him as deputy to the newly appointed Mullah Abdul Ghani Baradar during 2007, the Indian Express reported Akthar Mansour as appointed to the Taliban's Quetta Shura (council for political and military matters and affairs), sometime during 2007, while within Quetta. One source gives Mansoor as being appointed deputy to Mohammed Omar during 2010; another source states him to have been "by some accounts" the second most senior member of the Taliban behind Mohammed Omar, during 2010. A contradictory report states his appointment occurred during 2013 after Abdul Ghani Baradar, the then deputy, was jailed. A source claims to know of Akther Mansour having a "direct influence" over military units operating within Khost, Paktia and Paktika, at a time after his appointment to the Council of the Taliban. In a communique published 29 November 2011, the Mullah was identified with the reference number TI.M.11.01. as an individual associated with the Taliban and accordingly was made pursuant to sanctions, as of 25 January 2001, and those sanctioned were to have any available assets frozen, to be banned from traveling and to be subject to an arms embargo. in 2013 he convinced other Taliban leaders to open the group's political office in Qatar to initiate negotiations with the West. a fact which is corroborated by an additional report, which states the office was within Doha, Qatar. According to a 2014 report, Akther Mansoor, together with Abdul Qayum Zakir and Gul Agha Ishakzai, were stated to be involved in fighting over control of a major opium-producing area (land of Maiwand District) against a co-founder of the Taliban movement, Abdul Ghani Baradar. An article, published 12 March 2015, stated Mullah Mansour and Abdul Qayum Zakir, who were long-term rivals, had met together in order to find an agreement and at the meeting had slaughtered sheep for the purposes of a feast. The article stated Mansour was in favour of initiating so-called talks with Afghani government officials at the time, but was unable to make any progress in his own direction due to Zakir being opposed to the opening of a dialogue with the Afghan government. According to one report, dated 17 March 2015, Mullah Masoor was at that time deputy amir ul-momenin, military leader and head of the shura of Quetta. Mansour wrote a letter to Abu Bakr al-Baghdadi, on behalf of the Islamic Emirate of Afghanistan, released on June 16, 2015, in order to express his concerns of the potential for a negative influence of ISIS upon Afghan Talibans' progress, since ISIS activities might pose a risk of causing "multiplicity" within forces of the jihad of Afghanistan. The letter, appealing to the unity of "religious brotherhood", requests al-Baghdadi might extend "goodwill" to the Taliban, which "doesn't want to see interference in its affairs". The letter was written in the Pashto language, and released within the Voice of Jihad site. Additionally, the letter shows Mansour considered the late (Sheikhs) Abdullah Azzam and Osama bin Laden, the late Abu Musab al Zarqawi and Ibn al-Khattab, to be heroes. In addition the letter expresses recognition of the support to the Islamic Emirate of Afghanistan, of "famous religious scholars", of these he provides (Sheikh) Hamud bin Uqla al Shuaybi as an example. Akhtar Mansour was elected leader of the Taliban organisation on 29 July 2015. The results were announced on Thursday 30 July. The Taliban splinter group Fidai Mahaz claimed Mohammed Omar was assassinated in a coup led by Akhtar Mansour and Gul Agha. Taliban commander Mansoor Dadullah, brother of former senior commander Dadullah, also claimed that Omar had been assassinated. Mullah Yaqoob, Omar's eldest son, denied that his father had been killed, insisting that he died of natural causes. A Ṭālibān communique published 30 July 2015 stated Mullah Omar had died within hospital. Mullah Mansoor is said to have "closely kept the secret that Mullah Omar had been dead" despite the (leaking) of a report of Omar's death in 2013. Some Taliban sources considered Mansour's selection as leader to be invalid, while other senior Ṭālibān commanders and officials preferred Mohammed Omar's eldest son, Mohammad Yaqoob, to have ascended as leader. Yaqoob was said to have been supported by his uncle, Abdul Manan and former Taliban military chief Abdul Qayyum Zakir. The head of the Talibans' political office in Qatar, Tayyab Agha also opposed the selection of Mansour as leader. However, a statement allegedly from Zakir denied he had any conflict with Mansour. Yaqoob is known to have publicly rejected the appointment of Akhtar Mansoor. Mansoor announced one of his deputies to be Sirajuddin Haqqani. The Mullah is thought to have had dealings of some kind with the Pakistani Inter-Services Intelligence organisation. On 13 August 2015, al-Qaeda's media wing As-Sahab issued a pledge of allegiance from Ayman al-Zawahiri to Akhtar Mansour. Sometime within August, Mullah Mansoor sent a delegation to meetings with officials of the Afghan government, which was subsequently "hailed as a breakthrough". A Security Council report, dated to the immediate September after Mansours' inauguration, showed he, as the new leader, was unwilling to engage in negotiations for the purposes of assuring peace. The Brookings Institution reported the Mullah referred to his own leadership as Commander of the faithful, a translation of Amir al-Mu'minin. A separate source states the Mullah used this particular title to refer to his role as leader of jihad. The Mullah was, according to RAND corporation, and elsewhere, leading a jihad (i.e. an insurgent force) limited to concerns orientated only to within Afghanistan, and not elsewhere. According to a report published on 5 November 2015, the Mullah stated his opinion that modern education was a "necessity". The Mullah stated his position with regards to peace talks; the suggestion of his being willing to engage in peace talks as "enemy propaganda". The website of the Islamic Emirate of Afghanistan published a biography of Mullah A.M. Mansoor on the occasion of his becoming Emir. There were unconfirmed reports that Mullah Mansour was shot and wounded during a confrontation with other senior Taliban members inside a house on the outskirts of Quetta in Pakistan on 2 December 2015. Reports published in the following days claimed that Mansoor had died of his injuries. Sources for these reports included Taliban leaders and Afghan governmental officials, Afghanistan Vice President General Abdul Rashid Dostum was named by one media organization as a source, although the Afghan government is known to have previously released statements which later proved to be untrue. Members of the Taliban, including Zabihullah Mujahid, dismissed the reports, with claims they were falsification by their enemies. A report published 5 December, written by Jawad R Awan for The Nation magazine, reported that a statement was released by Latif Mansoor, personal aide to the Emir, which said that Mullah Mansoor was unwilling to comment on his status. On 21 May 2016, U.S. military conducted an airstrike against Mullah Mansour's vehicle coming from Iran, near Ahmad Wal, not far from Pakistan–Afghanistan border. It was reported by a United States Department of Defense official that Mansour had been killed in a U.S. drone strike in Pakistan. The reporting official, who was not sanctioned to speak publicly about the attack, said Mansour and a second militant were believed killed when a drone hit a vehicle in which they were riding. The death of Mansour was also later officially confirmed separately by the Afghan government and members of the Taliban. U.S. President Barack Obama confirmed on Monday, 23 May 2016, that Mansour had been killed in the American airstrike which he had sanctioned. President Obama stated afterwards that he had hoped Mansour's death would lead to the Taliban joining a peace process. U.S. Secretary of State John Kerry told a press conference: "Yesterday, the United States conducted a precision airstrike that targeted Taliban leader Mullah Mansour in a remote area of the Afghanistan-Pakistan border. Mansour posed a continuing, imminent threat" to U.S. personnel and Afghans. Kerry also declared that the leaders of both Pakistan and Afghanistan were made aware of the airstrike but he refused to elaborate on the timing of the notifications, which he said included a telephone call from him to Pakistani Prime Minister Nawaz Sharif. A U.S. State Department spokesperson claimed that "I don’t have any more clarity of where the actual strike took place. What I can say is that it was in that border region. I just can’t say on which side of the border it was." According to the Wall Street Journal, the strike took place on the N-40 National Highway as Mansour was being driven by taxi from the Iranian border to Quetta, after a "lengthy" stay in Iran. Later reports placed the missile strike close to the town of Ahmad Wal. The U.S. government agencies involved reportedly agreed that officials were to be vague about identifying the location of the strike, beyond saying it took place along the Afghanistan-Pakistan border. According to the International Institute for Counter-Terrorism, U.S. officials stated that Mullah Mansour's death was "unavoidable" due to the then Emir being unwilling to engage in peace talks. He was succeeded by Mawlawi Haibatullah Akhundzada. Mansour is alleged to have owned a cell-phone company, among other investments, and is claimed to have been wealthy as a result of his profiting from the dealings of Ishaqzai drug dealers. According to Richard Spencer of The Telegraph, Mansour performed his business operations via a residence located in Dubai. Born sometime during either 1960, 1963, 1965 or 1968. Joined war against Soviet invasion during 1985. Joined Maulvi Obaidullah Ishaqzai during 1987. Injured during battle during 1987. Student at Darul Uloom Haqqania madrassa 1994–1995. Made director of Ariana airlines during 1996. Sometime during 1996 appointed to Minister of Civil Aviation (including both domestic and military flights), Transportation, Tourism. Injured during battle May 1997. Listed for sanctioning by the United Nations as of 25 January 2001. Known to be involved in activities identified as terrorist within the provinces of Khost, Paktia and Paktika, Afghanistan as of May 2007. Made Governor of Kandahar by the then powers of the Taliban, as of May 2007. Attendee of meeting (2007) to organize bombing campaign to kill Ahmad Wali Karzai and Hamid Karzai. Appointed to the Quetta Shura sometime during 2007. Deputy to Mullah Abdul Ghani Baradar in the Taliban Supreme Council as of 2009. Temporarily in charge of the Taliban Supreme Council from February 2011. Identified as involved within the trafficking of illegal drugs, principally through Gerd-e-Jangal (within Afghanistan); 2011. Public statement as leader of Taliban as of 30 July 2015. During August and September 2015, the Mullah had sent a request to Mullah Dadullah to leave Zabul, using the Taliban shadow governor for Zabul, and subsequently sent fighters against the non-allegiant Mullah Dadullah. c.f. also M. Martin – text (p.145) published by Oxford University Press, 1 Jul 2014, The Diplomat Magazine August 12, 2015 – Kambaiz Rafi "...Mansour's swiftly appointed first deputy, Mawlawi Haibatullah, is from his Ishaqzai tribe, enraging Zakir who belongs to the staunchly rival Alizai tribe..."
^ a b c Sami Yousafzai. article. published by CBS 10 September 2015. Retrieved 2015-11-02. ^ a b c d e "Introduction of the newly appointed leader of Islamic Emirate, Mullah Akhtar Mohammad". Shahamat. 31 August 2015. Archived from the original on 2015-09-04. Retrieved 31 August 2015. ^ a b c Official Journal of the European Union. COMMISSION REGULATION (EC) No 969/2007 of 17 August 2007 amending for the 83rd time Council Regulation (EC) No 881/2002 imposing certain specific restrictive measures directed against certain persons and entities associated with Usama bin Laden, the Al-Qaida network and the Taliban, and repealing Council Regulation (EC) No 467/2001. published by the Official Journal of the European Union 17 August 2007. Retrieved 2015-10-30. ^ a b c d Shereena Qazi. POLITICS. published by Al Jazeera Media Network 03 Aug 2015 19:16 GMT. Retrieved 2015-08-03. ^ a b c d e f g "Biography of new Taliban leader Mullah Akhtar Mansoor". Pajhwok. 31 July 2015. Retrieved 10 February 2017. ^ a b "Unclear whether Mullah Mansour killed in Afghanistan or Pakistan: US". Retrieved 24 May 2016. ^ a b "Who is 'new Taliban leader' Akhtar Mansoor?". 30 July 2015. Retrieved 10 February 2017. ^ a b c "US drone strike in Pakistan kills Taliban leader Mullah Mansoor". ^ a b "Taliban leader reportedly killed in drone strike – RTÉ News". Rte.ie. Retrieved 2016-05-22. ^ a b "Obama confirms death of Taliban leader Mullah Mansour". ^ a b "Mullah Omar: Taliban choose deputy Mansour as successor". BBC. 31 July 2015. Retrieved 31 July 2015. ^ a b B. Dam. article. published by The Guardian. August 1, 2015. Retrieved 2015-11-08. ^ a b c Robert Crilly & Ali M Latifi. 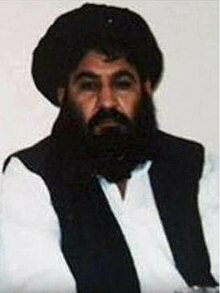 Profile: Mullah Akhtar Mansoor. published by Telegraph Media Group Limited 30 Jul 2015. Retrieved 2015-08-02. ^ a b c d e f g h i Security Council. Press Release of Security Council 1988 Committee Entries on Its Sanctions List. published 29 November 2011. Retrieved 2015-10-30. ^ a b c d e M Ilyas Khan. News Analysis. published 30 September 2015 by the British Broadcasting Corporation. Retrieved 2015-10-30. ^ a b c M. Rosenberg. News Analysis. The New York Times Company December 28, 2014. Retrieved 2015-07-30. ^ Sami Yousafzai (31 July 2015). "Up Close With the Taliban's Next King". The Daily Beast. Retrieved 31 July 2015. ^ a b c The Indian Express. Indian intelligence officials allege Akhtar Muhammad Mansour, the newly-appointed chief of the Afghan Taliban, might possibly have played a role in the hijacking of Indian Airlines flight IC-814 during 1999. The Indian Express [P] Ltd. Retrieved 2015-08-03. ^ "IC-814 hijacking: New Taliban chief Mullah Akhtar Mansour escorted Maulana Masood Azhar, says Ex-RAW officer". The Indian Express. 3 August 2015. Retrieved 6 August 2015. ^ a b c W. Roggio. report. published June 16, 2015 by The Long War Journal. Retrieved 2015-11-06. ^ a b c "Google Translate". Retrieved 4 December 2015. ^ FM Secretary of the State (Washington). SECRET COMMUNICATION (now unclassified) – p.131 (PDF). UNITED STATES DEPARTMENT OF STATE REVIEW AUTHORITY 14 Dec 2006. Retrieved 2015-08-05. ^ a b c Orlando Crowcroft. Society – Politics. IBTimes Co., Ltd July 30, 2015. Retrieved 2015-08-04. ^ a b Deutsche Welle (December 3, 2015). "Mullah Mansoor′s rise to the Taliban leadership". dw.com. ^ Deutsche Welle. "About us". dw.com. ^ "Pakistan frees top Taliban leader Abdul Ghani Baradar". BBC News. Retrieved 4 December 2015. ^ J. Ahmad; M. Zahra-Malik. article. published March 12, 2015 by Reuters. Retrieved 2015-11-06. ^ Reporter of Tribune wire. report. published August 2, 2015 by The Chicago Tribune. Retrieved 2015-11-10. ^ "Pakistan exposed Mullah Omar's death for its own interests: Kandahar clerics". Khaama Press. 18 August 2015. Retrieved 22 August 2015. ^ "Mullah Omar: a myth of convenience". The Hindu. 20 August 2015. Retrieved 22 August 2015. ^ "Why the Taliban murdered their own leader and the terrifying fallout now threatening the West". The Mirror. 21 August 2015. Retrieved 22 August 2015. ^ "Taliban's Mullah Omar died of natural causes in Afghanistan, son says". Reuters. 14 September 2015. Retrieved 30 September 2015. ^ a b Richard Spencer. article. published by Telegraph Media Group Limited 5th October 2015. Retrieved 2015-10-30. ^ a b AP. News – World:Middle East. SUNDAY 02 AUGUST 2015. Retrieved 2015-08-02. ^ "New Taliban leader Mullah Akhtar Mansour calls for unity". BBC News. Retrieved 6 August 2015. ^ "Mullah Omar: the one-eyed man who was king". The Economist. 30 July 2015. Retrieved 10 February 2017. ^ "Taliban leaders dispute appointment of Mullah Mansoor". al-Jazeera. 4 August 2015. Retrieved 22 August 2015. ^ "Taliban political chief in Qatar Tayyab Agha resigns". BBC. 4 August 2015. Retrieved 22 August 2015. ^ "Exclusive: Walkout at Taliban leadership meeting raises specter of split". Reuters. 31 July 2015. Retrieved 22 August 2015. ^ reporter for British Broadcasting Corporation. Al-Qaeda's Zawahiri pledges loyalty to new Taliban chief. BBC. Retrieved 2015-08-13. ^ S. Shay. report. published by the International Institute for Counter-Terrorism 04.08.2015. Retrieved 2015-11-10. ^ Shashank Joshi. article. published by British Broadcasting Corporation August 5th, 2015. Retrieved 2015-11-10. ^ "Introduction Of The Newly Appointed Leader Of Islamic Emirate, Mullah Akhtar Mohammad (Mansur), May Allah Safeguard Hi) – Islamic Emirate Of Afghanistan". Archived from the original on 2015-09-04. Retrieved 30 April 2016. ^ "Afghanistan seeks to establish fate of 'injured' Taliban chief". Yahoo News. 3 December 2015. Retrieved 4 December 2015. ^ "Conflicting Reports on Taliban Leader's Status Highlight Fraying Unity". New York Times. December 3, 2015. Retrieved December 4, 2015. ^ a b Indo-Asian News Service. "Afghan Taliban chief Mullah Akhtar Mansour dead". India.com. Retrieved 30 April 2016. ^ "After Taliban's denial of its leader being wounded, Kabul declares Mullah Mansoor was killed". www.firstpost.com. December 4, 2015. Retrieved December 4, 2015. ^ "Fate of Afghan Taliban leader Mullah Akhtar Mansoor unclear". The Nation. 4 December 2015. Retrieved 30 April 2016. ^ "Taliban supremo Mullah Akhtar Mansour dies: Afghanistan officials". The Times of India. Retrieved 30 April 2016. ^ "Taliban leader Mullah Mansour 'wounded in shoot-out'". Telegraph.co.uk. 2 December 2015. Retrieved 4 December 2015. ^ "Taliban leader Mullah Akhtar Mansour killed, Afghans confirm". BBC News. Retrieved 22 May 2016. ^ "US drone strike in Pakistan kills Taliban leader Mullah Mansoor". The Guardian. Retrieved 22 May 2016. The document showed that earlier on Saturday he had crossed into Pakistan from Iran at the Taftan border post, some 450km from where he was killed. ^ "Taliban leader Mansoor killed by U.S. drone". Usatoday.com. 2001-09-11. Retrieved 2016-05-22. ^ "Family of driver killed in US strike on Taliban leader file criminal case". Retrieved 30 May 2016. ^ "Mullah Mansour: The trail of clues after Taliban leader's death". Retrieved 25 May 2016. ^ "Afghan Taliban announce successor to Mullah Mansour". BBC News. 26 May 2015. Retrieved 26 May 2016. This page was last edited on 30 March 2019, at 15:18 (UTC).